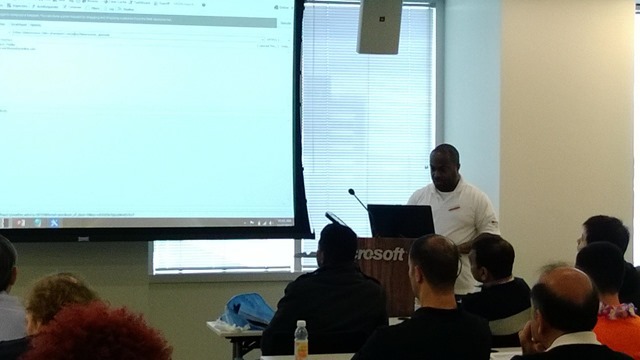 Another year and another successful even by the Organizers (Dan, Adam, Rachel) and all the Volunteers at SharePoint Saturday Washington D.C. – Reston. I was honored to be an accepted speaker and I delivered this session “The Evolution of Workflows in SharePoint 2013 – A Story about External Calls with REST & JSON”. This was truly a magnificent event with a great turn out, good mix of attendees, and they were very engaged, asked serious and deliberate questions , and didn’t even mind as yet again i go a little bit over in my Live Demos. Its always great to meet face to face the folks that you interact with daily on social media in our SharePoint community, foster new relationships, maintain old ones, and Share a Pint at the end of a day where we all walk away with a bit more knowledge in this technology we all share. I was very please for all the attendees that made my session ‘standing room only’ and if any of you all have pics, please email them to me, i would really appreciate them for my blog post. Make sure to attend the inaugural #SharePoint Saturday, the one that started it all SharePoint Saturday Virginia Beach on January 11th 2014 & of course stop by my session (well after you register here) on Optimizing your SharePoint 2013 with BCS an External Data where we will discuss strategies, security and all the various models to interact with your LOB systems. As well, I will be delivering three (3) Sessions at SharePoint Conference 2014 March 3rd through 6th 2014 (#SPC14 or @SPConf) in Vegas check out this link for my sessions.